There is a little boy in our neighborhood who is Ben's age. Saturday is his birthday party, a dinosaur themed day at the park. When I RSVP'd, his mom said she was happy we were coming, because we always give the Very Best gifts. Oh dear, I thought, as I scrambled to remember what we'd given him in the past few years that was worthy of being called the Very Best. I love to give gifts. I love it when I see something that is just perfect for someone, and when they open it I love the look of delight on their face. I'm a good listener, and I remember the little details to save away for later. Many years ago my mother-in-law told me about these violet candies she ate as a child, and what a huge treat they were. A year or two after our conversation I was at a vintage candy store and saw the candies she had been talking about, and promptly bought a package. When I later presented them to her, it was like watching her get on board a time machine back to the days of her youth as she savored her treat. She is probably my favorite person to give gifts to, because she forgets that she has told me all these things and thinks I'm a mind reader! Unfortunately with the economy being what it is and job security being tenuous at best, we have reined in our spending to the point that our previous generosity for things like wedding gifts, baby shower presents, and birthday giving has been scaled back substantially. This is tough. Especially since we have apparently acquired a reputation as stellar gift givers! So what to do about our weekend birthday party? 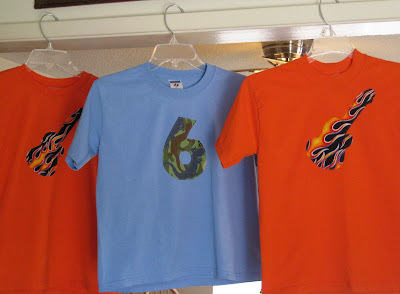 One of my Northern California friends recently blogged about these tees she made for a birthday party, and I decided to give it a try. While I was at it, I made a couple for my kids as well. We also picked up a cool glow-in-the-dark dinosaur puzzle and some dinosaur ink stamps to go along with the theme. So I didn't invest very much money into the gift, but instead gave my time. Which is good for everyone, especially my own kids who got to sit and watch all the steps of construction along the way. Quite impressed with the end results, they are now busy sketching out designs for making their own. So far, their favorite design is toast. Seriously. A piece of toast, on a tee shirt. So just in case toast on tees becomes the latest fashion fad, remember you heard it here first!